Teva, the world’s number one sport sandal brand, last year embarked on a strategy to broaden its market and increase year-round sales. The US company, owned by Deckers, commands 60 per cent of the outdoor sandal market and can be credited with introducing a new footwear category in-store, with major brand names such as Nike following in its footsteps. Teva is a technical-based brand at the top end of the market, appealing to the enthusiast who takes an interest in water sports. The brand is sold in retail outlets across the globe, from the UK to United Arab Emirates and Canada to Costa Rica. But as a sandal brand it was difficult to get a large, permanent presence in retail. However, this spring the company launches a closed footwear range in a bid to extend its market reach. The move enables Teva to build its in-store presence. But with 111 individual styles to display, plus the new lines, it faced the problem of how to showcase its product in a way that sits equally well in independent outlets as it does in department stores. The company chose Bristol-based Fords Design to develop an in-store design that would communicate the main values of the brand, while being flexible enough to fit any environment. ‘As it is an outdoor range we used natural materials – timbers, metals and no plastic – while reflecting the fact that they are also the most technically advanced sandals,’ explains Fords Design chief executive Martin Law. 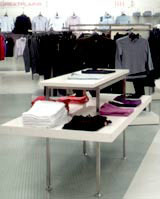 The retail identity comprises transportable, freestanding displays that will fit all retail spaces. There are single and double wall-bay modular units that can be used individually in small areas or put together as a run of bays or a corner to make a shop-within-a-shop for department stores or large high street stores such as Field and Trek in the UK. There is also a pallet unit that holds boxed stock within the display. According to Arthur Van der Kroft, European sales and marketing manager at Deckers Europe BV, European retailers demand this type of retail system as it is self-servicing and saves on staff costs. The graphics are also flexible. ‘We have incorporated outdoor imagery that can be updated on a seasonal basis,’ says Law. Last year the company tested the design in Field and Trek outlets and saw sales rise by 48 per cent compared to the control store. On the back of this the design is now rolling into 200 stores in a variety of countries.